IRUS-UK continues to respond to users’ needs with a new development released in time for OA week. 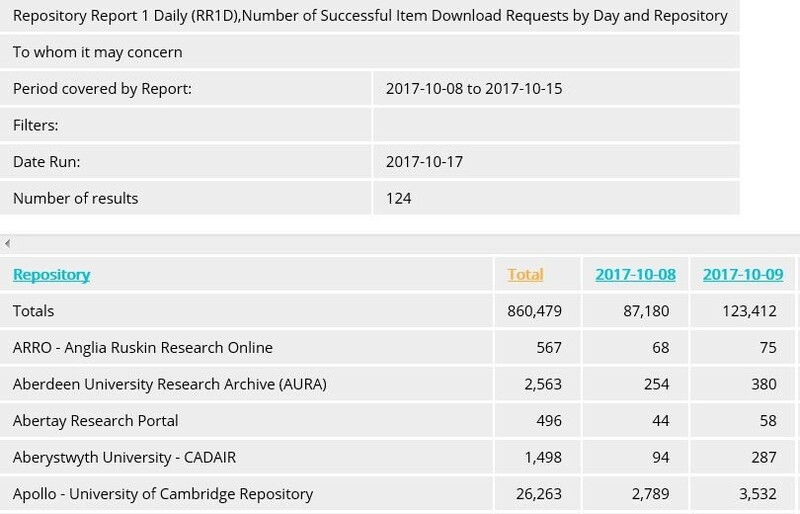 For example, the service has recently been asked by one of our institutions, Apollo – University of Cambridge Repository, to measure the impact of OA week advocacy campaigns on the usage of their institutional repositories (IRs) before and after OA week through being able to see usage statistics on a daily basis. 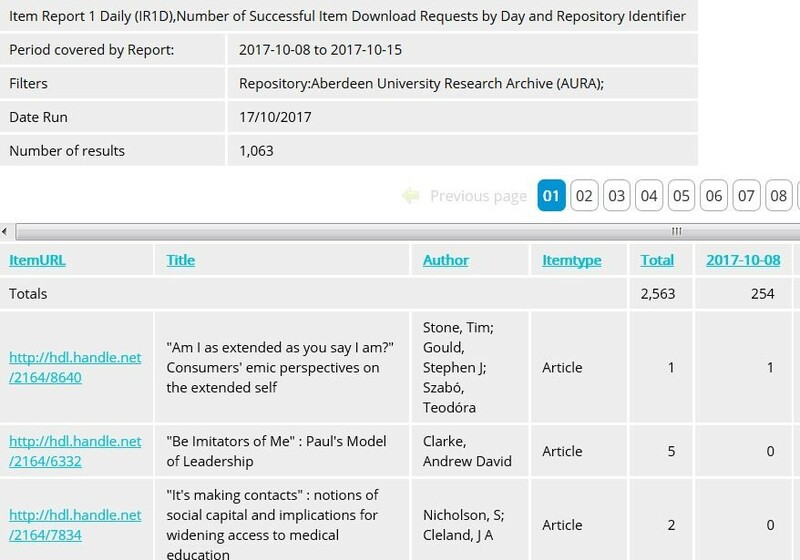 Item Report 1 Daily (IR1D), the number of successful item download requests by day and repository identifier. 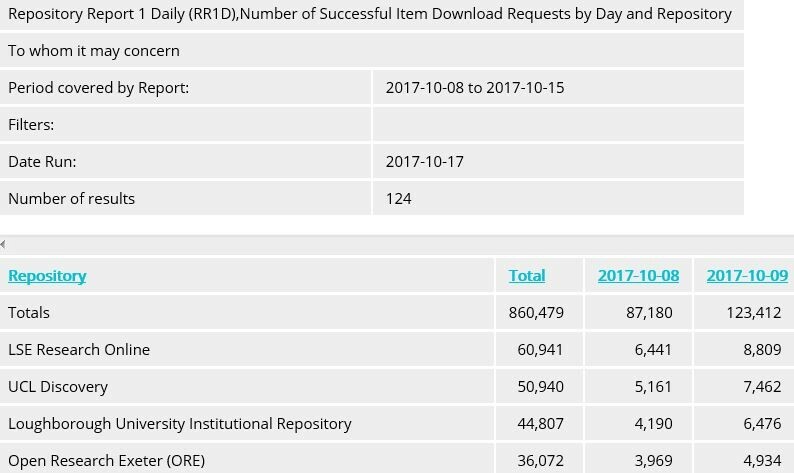 Repository Report 1 Daily (RR1D), the number of successful item download requests by day and repository. IR1D: In order to find out the details of each item that has been downloaded on certain days, from a specific repository, select IR1D and then enter the date or date range and the repository name. You also have the option to select a specific item type, if you filtered one, or all item types if you didn’t use the optional filter. The results can be ordered by title, author, item type or total. 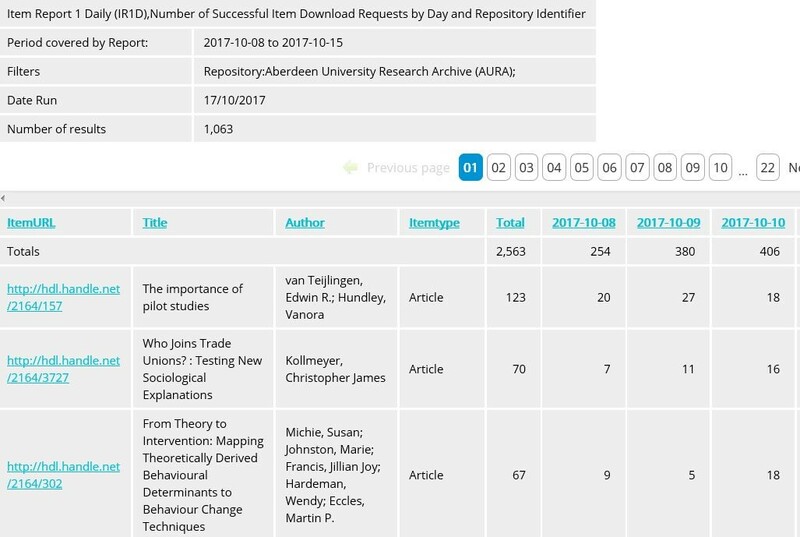 RR1D: In order to find out the number of items downloaded on certain days from all participating repositories, select RR1D and then enter the date or date range. You also have the option to select the item type. The results can be ordered by repository or total. OA week gives us a time to reflect on achievements that have been made in setting information free and making it accessible to anyone who needs it. One of the successes is in the development of IRs. The standardisation of processes to measure how much they, and their contents are used means that we now have usage statistics as evidence of their value. Potentially this new IRUS-UK development will enable anyone to gain a national picture of national advocacy campaigns, such as OA week. IRUS-UK is a service which helps institutions do just that. It was launched as a service in July 2012 in order to track the extent of usage of UK IR’s using common standards for measurement. It is exciting to see the growth in the usage of materials in IRs since IRUS-UK started. In the last year 20 new repositories joined us – bringing us close to 130 participating IRs – and we recorded nearly 30M downloads, in total, across participating IRs. In September alone there were more than 2.7M downloads. Posted by Hilary Jones on October 18, 2017 in IRUS.